Telling a child he/she will be wrapped in a rainbow sounds wonderful doesn't it, but here is the real truth. It's still a straightjacket, papoose board, pediwrap, no matter the pretty colors. At Specializedcare.com here is the info on the "Rainbow Wrap". Note at the bottom it tell the dentist/user to check with their state laws on using one of these. On the website this is the "fine print", I made it the Large Print. The Rainbow® Stabilizing System is the most flexible and comfortable system available to prevent sudden and unsafe movements. 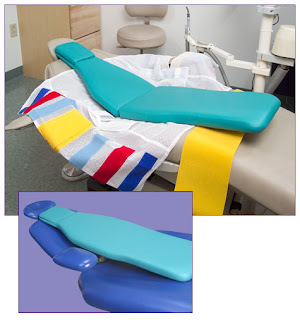 The mesh wrap is breathable to reduce patient overheating and the soft padded board provides greater patient comfort. The NEW Rainbow Wrap is made of "sport-mesh," which is strong, but less rigid, making it more comfortable for your patient. The Rainbow Wrap is now 'coat-length,' meaning that it stops above the knee. A wide, 6-8" velcro strap is provided to stabilize the legs and knees and to prevent kicking. With this strong strap, the legs can be stabilized first, so the patient will be better controlled as the Wrap is secured. The Rainbow Wrap can be used as a one-piece or a two-piece wrap. Velcro strips lock the top and bottom halves of the wrap together, for those who prefer a one-piece system. Just remove the Velcro strips to have the flexibility of two-section Wrap. The Rainbow Stabilizing System now comes with a Laundry Panel. When this panel is placed over the 'hook' Velcro on your Rainbow Wrap prior to laundering, it will help prevent lint and other materials from sticking to the Velcro, thus extending the life of your Wrap. Head stabilizers are sold separately. Important: Consult the appropriate authority in your state for regulations on the use of stabilizing devices.